Biofeedback is a powerful tool for creating lasting change in the habitual activities of the nervous system. Through skillful guidance and regular practice, you can learn how to gain influence over your physiology and associated states that occur outside of the training sessions. Clients who train regularly report being happier, less anxious, have less physical and emotional pain, and better able to achieve their goals. During a biofeedback session, the client views a measurement of an aspect of his or her physiology, such as brain waves, heart rate, or muscle tension. The monitoring allows subtle changes, usually below the threshold of conscious awareness, to be observed on the computer screen. 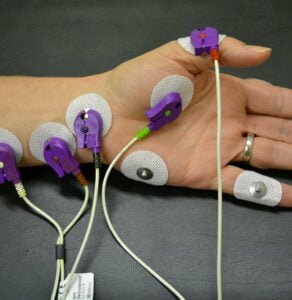 Originally, biofeedback focused exclusively on elements of the stress response within the peripheral nervous system, such as the level of sweating in the hands, blood flow to the fingers or toes, and muscular tension. In recent decades, biofeedback training has expanded to include making changes to specific brainwave and heart­rate patterns. Brainwave biofeedback is often referred to as neurofeedback. Heart­-rate variability training, a commonly employed biofeedback tool, is effective for mood stabilization and enhancing self­-awareness. Here at The Center, we offer a wide range of biofeedback options, from simple trainings done at home to customized, comprehensive multi­modality trainings supervised by our highly skilled practitioners. We are committed to understanding your needs and creating a training program that works best for you.